This fun and flirty designer dress will definitely get you noticed—it reminds us of disco era style. The Gold Sequin Bustier Chiffon Dress is fully lined and has a subtle bustier top with a lined and lightly padded bust. 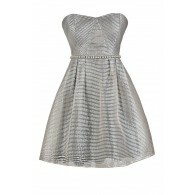 Miniature gold sequins decorate the top of the dress and allow you to shine. The attached skirt is crafted of black chiffon fabric and has a flowy shape. 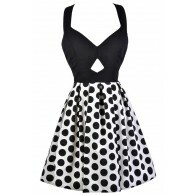 Adjustable spaghetti straps and an invisible side zipper complete this great party dress. It would be perfect to wear to any dance or cocktail party and would look great paired with strappy black heels and some pretty jewelry. Details: Fully lined. Lined and lightly padded bust. Adjustable spaghetti straps. Invisible side zipper. 100% polyester. Dry clean only. Small measurements: Length from top of bust to hemline: 29”. Bust: 32”. You have added Gold Sequin Bustier Chiffon Dress by Ark and Co into Wishlist. You have added Gold Sequin Bustier Chiffon Dress by Ark and Co for Stock Notification. You have set Gold Sequin Bustier Chiffon Dress by Ark and Co as a loved product. 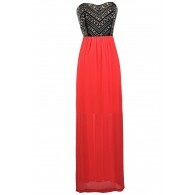 You have removed Gold Sequin Bustier Chiffon Dress by Ark and Co as a loved product.